SeeMore is a project that melds Art and Engineering to distill abstract concepts in computing into a tangible experience that informs viewers that computational thinking does not exclusively exist within the preverbal “black box”. This kinetic sculpture showcases the inherent beauty of parallel algorithms through the correlating movements of an animatronic 256-node Raspberry Pi computer cluster. Each node in the cluster is independently linked to one Hitec HS-5485HB digital servo which articulates that computer board outward in proportion to its individual processing load. This piece provides visual cues representing computational thinking as it occurs real-time, and in parallel to solve problems. Sometimes computation occurs as a collective while other times, devices divide the tasks, then compute and share information in distinct patterns forming wave fronts or cascades. 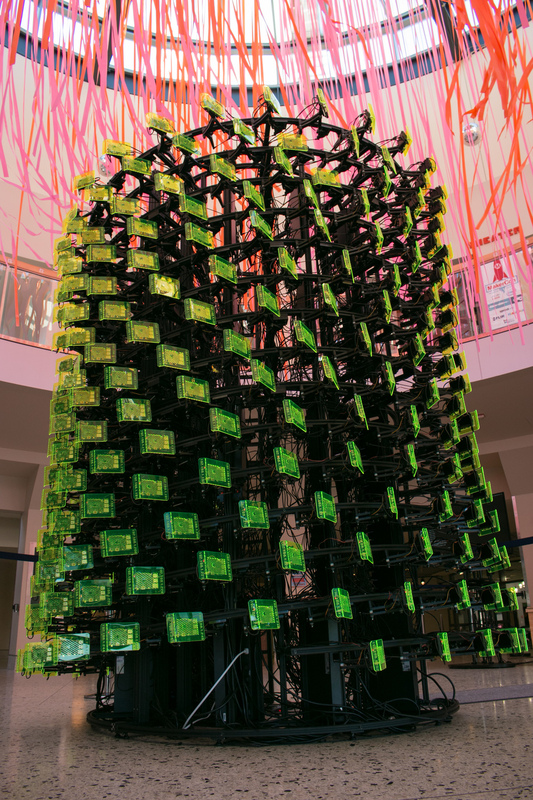 The work showcases the elegance and significance of parallel computation to viewers while simultaneously educating and inspiring parallel computational thinking. The cylindrical structure is inspired both by early parallel Cray computer designs as well as taking cues from the fluid dynamic simulations these powerful computers are regularly tasked with calculating. While an expert may appreciate the subtle beauty of parallel computation, the act of dividing tasks, distributing and communicating data is hidden from the naked eye. This project translates data movement through a living sculpture that physically represents computation as it propagates and evolves across the surface of the form.